New Three Quarter size (3/4) violins from Gliga, Primavera, Hidersine and others, carefully selected for quality and good value for money. Don't forget every instrument is carefully inspected and professionally set up in our workshop ready for you to play before it is despatched..
Violins that are available to rent have a rental button alongside. Before you decide to rent please read our terms and conditions on the rental page. 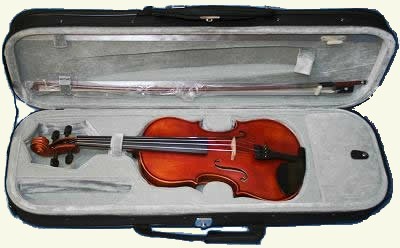 A 3/4 sized version Primavera 200 violin outfit. This is the model that won the Best Value Bowed Instrument at the Musical Industries Awards a few years ago. Since then it has been improved with a new Carbon Composite Bow, a new case with a more student proof handle and reflective strips, making it really stand out in vehicle headlights. A useful safety feature. Still made from well selected, hand carved tone woods with Ebony fittings this is an excellent student outfit and one of our best sellers. Hidersine Vivente 3/4 size Student violin outfit. This violin has just won the MIA award for the best value violin this year. A nicely made student instrument. Comes complete with a Brazilwood bow and rosin in a lightweight oblong case. Exceptional value for money from a well respected string supplier. 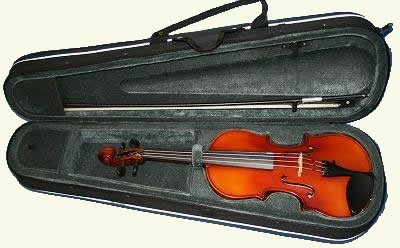 This is an upgraded version of the Primavera 200 violin. We replace the factory Steel strings with Corelli Crystal strings and spend more time on the set-up. The difference is amazing, it sounds so much nicer and is so much easier to play. 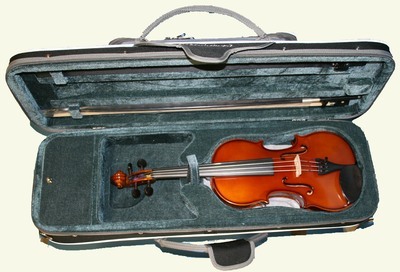 Improved version of the best selling Primavera Loreato Violin outfit. Fitted with Corelli Crystal strings and with a much improved setup in our workshop. This gets the best out of an already good violin and produces a 3/4 sized student outfit that is superb value for money. Our best selling model !